I am a bit of a camera bag junkie! I think a lot of photographers feel this way too. We are always searching for the perfect bag…but I’m not sure if such a thing exists. The perfect bag for street photography surely isn’t the perfect bag for hiking into the wilderness. I think that’s why many of us end up with multiple bags. For nature and landscape type photography, I personally opt for a backpack style bag. They are more comfortable for carrying while moving around, especially on terrain that can sometimes be rocky or unstable. I have tried many, many backpack style bags and there have been features on some that I liked while not liking other features…the perfect backpack is still something I hunt for! One feature I absolutely love on a backpack is where the back is actually where you access the interior – this allows you to lay the pack on the ground on the front, i.e. the part of the back that doesn’t go against your body when you are wearing the pack. This keeps you cleaner! My favorite bag manufacturer, ThinkTANK Photo has only just recently introduced a backpack that features this…the new Trifecta series packs, but the current models are a bit small for my preference. When going out for a street photography excursion, I choose a shoulder bag that I wear messenger-style – strap crossing my body. This is secure and allows easy access to the inside by just sliding the bag around to the front and then I can slide it back around to my hip when done. For a studio shoot, I may end up taking a large roller bag or even a couple different bags because sometimes you end up taking a couple camera bodies, all your lenses, plus lighting equipment. I have a big, rolling tool case that I use to carry strobes, light stands, reflectors, umbrellas, extension cords, etc. for going to a studio shoot. It’s just a big empty box basically, used for hauling tools to a job site…I got it at Home Depot…so when I take that, I can get away with taking a smaller bag for my camera/lenses. It doesn’t offer much in the way of protection, so I keep my strobes in their cases and just put them in the box that way. It’s not the most elegant solution, but it does make transportation of a bunch of lighting gear a lot easier. The following rundown of bags is by no means all of the bags I have, but is a good selection of a variety of bag styles! The Uinta backpack from Gura Gear is my current choice for carrying my Fuji gear for outdoor photography. I did a “review” of it HERE so I won’t go into huge detail here. Long story short, it is the most comfortable backpack I have ever used. It is extremely well made while still being pretty lightweight. The design of the Uinta allows for your choice of gear “modules” that you then put into the actual pack. There are two sections – an upper and a lower – and you can access from either the front or the back. I choose to access from the back (the part that goes against your back when wearing it). This way you don’t transfer dirt or anything to your back when you put the pack on. I have the Medium Pro in the top section and the Small Pro in the bottom section, and there’s plenty of room for ALL of my Fuji gear and then some. Zippers are great…the straps are super comfortable, breathable, and adjustable…stitching is strong and clean. It’s just a fantastic photo backpack. Like all ThinkTANK products, the Airport Accelerator is a great piece of kit! It’s built like a tank and can absolutely take a beating. There’s almost endless adjustability inside for protecting your gear. I use mine to carry and store my Nikon gear, so it obviously gets pretty heavy but the AA swallows the gear up and makes carrying it all as comfortable as carrying that much gear can be. Nikon D4 body, D3s body, 16-35 f/4 lens, 24-70 f/2.8 lens, 70-200 f/2.8 lens, 90 f/2.8 Macro lens, 2x Converter, and more all goes inside. The shoulder straps are well padded and I have actually removed the waist straps…since I don’t use the AA for long term hiking or carrying, I decided to remove them. The only thing I don’t like about it is that it’s front opening. It’s so strong and beefy that it has the ability to make a heavy load of gear seem not quite as heavy. The Nova Sport 35L AW is a shoulder bag…a BIG shoulder bag. It’s almost as thick as it is tall. When I got it, I definitely didn’t need another bag, but Adorama was running a special on it…$23.96 or something like that – I had a small Adorama rewards credit so it ended up being less than $16 shipped to me. The only reason I can imagine it being sold that low (normal price was $109.99) is the color…it’s Pepper Red and boy is it bright! It’s a decent bag, but it’s not great. It’s a large bag, and being so large it can really pack a lot of gear inside. The shoulder strap is crap & definitely needs to be beefier though. I feel given the amount of gear it can hold, it’s just not thick or comfortable enough. I may end up using the shoulder strap that came with my ThinkTANK Airport Navigator instead of the stock Lowepro strap. Empty, the bag is pretty light and it’s made very well. There are two stretch pockets on the ends that can easily hold a water bottle. There are two velcro pockets under the large top flap, and a padded slot that can easily hold my 13″ Macbook Pro. The pocket on the back can be unzipped at the bottom so you can slip it over the handle and then carry it on top of a roller bag. The problem with a shoulder bag this size is you almost always fill it with gear making it so heavy that it’s just not comfortable to carry. Luckily the shoulder strap is very long and can be adjusted to carry messenger-style, i.e. across your body. It will probably make a good “studio” bag for me…carry a ton of gear to the studio and then work out of it without needing to wear it. The Retro 7 is currently what I call my “carry everyday” bag. I did a review of it that you can find HERE. At the time of writing this, I am carrying both my Fuji X100T and my Fuji X-T10 in it. It is a super bag…well made, comfortable, and durable. It wraps around your hip when wearing messenger-style and is easy to work out of while wearing. It doesn’t scream PHOTOGRAPHY GEAR INSIDE which is a bonus (although with their popularity with street photographers a lot of people probably know that there is gear inside! ), and is extremely popular as a street photography bag. I have the Pinestone color which is kind of a faded green color, and it’s also available in all black (which is a slightly different kind of material) and blue slate which is kind of a denim looking color. I’d love to see more colors and have even told TTP that a “brick red” color would be awesome. The Retrospective bags have a broken-in, used look even when brand new and they wear and age well for an “everyday” bag. These two backpacks were the packs that first introduced me to backpacks that open on the back for gear access as opposed to opening on the front like the majority of photo backpacks. This feature is much preferred for outdoor photographers as it is easier to work out of, and it helps keep our backs clean! These packs are also very lightweight while still being constructed nicely. Their shoulder straps are similar to the Gura Gear Uinta’s straps – they are lightweight, breathable, and comfortable. The 15L is perfect for a quick trip to the zoo when I just want to carry my D4 with the 70-200mm f/2.8 lens and 2X converter, an extra battery, a couple accessories, and maybe a bottle of water. When I’m shooting and the camera/lens is in my hands, I forget the 15L is even on my back it’s so light and comfortable. I’m currently using the 20L to hold my Sony and all the majority of the legacy lenses I’ve collected…it has plenty of room for all of that. The 20L doesn’t really look much larger than the 15L, but it definitely holds a lot more gear and there are also some handy zippered pockets on the front that the 15L is sorely lacking…the one major fault with the 15L. They both have a zippered pocket on one side that will hold a water bladder system, and the other side has a pretty intelligent tripod carrying setup, though I usually don’t carry a tripod with the a bag, I usually just carry it in my hand. I could see me using it for a smaller tripod like a MeFoto or a Manfrotto BeFree size tripod. Also like the Uinta, the back panel on the these packs have a nice design for airflow. The Airport Navigator is a smaller roller bag that can still hold a large amount of gear. You can access the gear either through the zippered top, or lay it down on it’s back and the zippered front lid can be opened. I set it up like most do with the top lid accessing two camera bodies (lenses attached) and then the front lid can be opened to access other lenses or accessories. It’s built just like the other TTP rollers so obviously it has a fantastic build quality. The wheels are rollerblade style and are replaceable. The retractable handle extends high enough so you can use it without any need to hunch over. It has a nice, beefy grab handle on the top so if you need to pick it up on rough terrain or to toss it into the trunk or overhead compartment you can. It has a padded slot for a laptop, or you can slide in a couple of collapsible reflectors. It looks pretty small (especially for a roller) but holds more than it looks like it would. It’s also an easy fit for the overhead bins on airplanes, and makes a great traveling partner with a second bag like an Urban Disguise that can slip over the collapsible handle. The Urban Disguise 50 is a premium shoulder bag from ThinkTANK. It’s construction is second to none…big, strong zippers…strong, comfortable leather handles…thick padded shoulder strap. It can hold my D4 with a lens attached pointed down with two other lenses on the sides. The shoulder strap is removable in case you’d rather carry it like a briefcase. A nice touch is the back “sleeve” that allows you to slide it over a roller bag’s handle…I carry it on top of the Airport Navigator when I need to carry A LOT of gear. Like all TTP bags, there is a plethora of pockets inside and under the front flap for whatever you need to carry. it even comes with a Pee Wee Pixel Pocket Rocket memory card holder. It’s also available in a V3 version called the Classic which is basically the same bag with full grain leather accents and front panel, which I guess would make it a touch classier for business or wedding photographers. 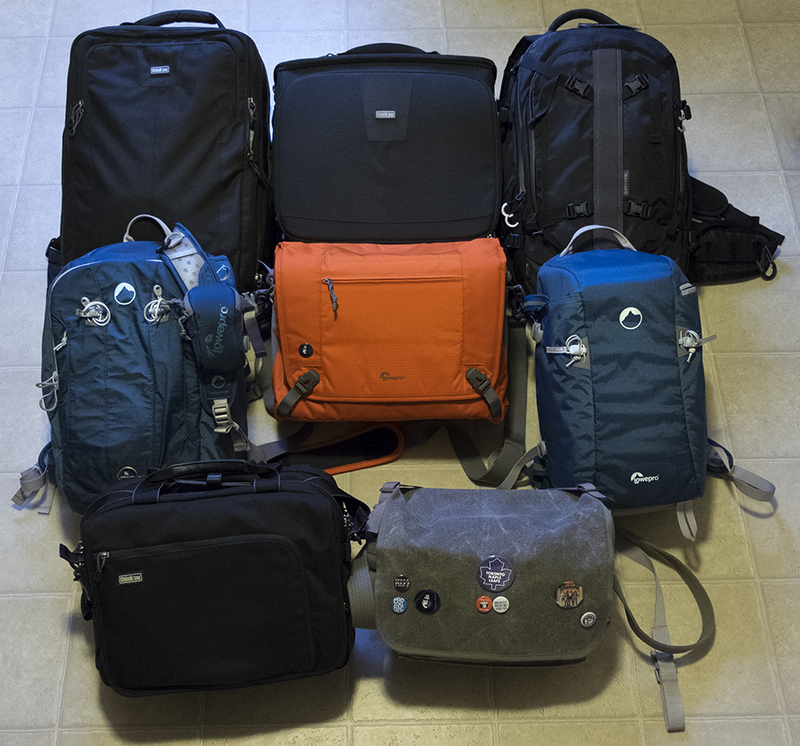 The majority of the bags I own are great bags…but none of them are perfect. The closest bag to perfect, FOR MY USE OF IT, is probably the Gura Gear Uinta…it’s light, it’s easy and comfortable to wear, it’s easy to work out of, and it holds what I need it to hold easily. I would love to see a ThinkTANK Airport series backpack with a rear opening panel instead of the front…that’s really the only thing I don’t like about my Airport Accelerator. I would also welcome a faded red color (and other colors) in the Retrospective line…as popular as they are with so many photographers, I think more colors would be welcomed by many.